The Ministry of AYUSH and QCI (Quality Council of India) has developed a Voluntary Scheme for Evaluation and Certification of Yoga Professionals which is valid internationally. This initiative was needed strongly because of the gap between the yoga being practiced now and Yoga that it originally stands for. Hence the focus of the Scheme for Voluntary Certification of Yoga Professionals, as it is being called, is to certify the competence of Yoga Professionals in the light of the legacy of Yoga knowledge. 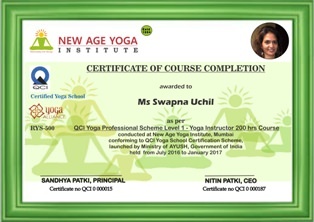 New Age Yoga Institute is a QCI certified Yog School to conduct 200/ 350 hr Level 1/2 courses. This course held at Vile Parle (E) Mumbai, is a 200 hour Level 1 course as per the prescribed norms of syllabus of QCI, led by Sandhya Patki, one of the first teachers to get certified under the Scheme. Course will be followed by an internal and certification board examination. Successful candidates get QCI certficate, and all candidates get a NAYI course completion certificate. 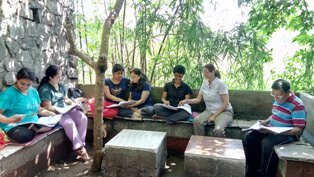 QCI Level 1 course design is well balanced to include the best of the Yog practices and theory required by any International Yog teacher to conduct an authentic Yog course for interested participants. The syllabus confirms to QCI design, which covers all the strengths of all the major schools while adhering to the ancient classical texts of Yog viz. Hatha Yog Pradipika, Patanjali Yog Sutra, Gheranda Sanhita..
New Age Yoga Institute is the first Institute to start a course on QCI syllabus in April 2016. Though this course was not as per the QCI norms (Scheme of Yoga school not being launched till then) there were 30 participants who enrolled, 26 appeared for exam and 18 passed the Level 1 examination. Being a professional examination the national passing percentage is a low 25-35%, however since the Yoga schools are audited by QCI for their teaching quality, New Age Yoga Institute is able to produce good results with 90% candidates passing examination. 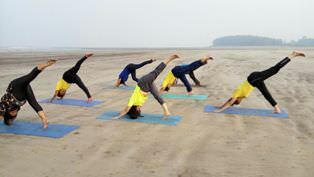 Entire faculty is QCI Level 2 certified teachers or professional doctors well versed with subject of Yoga. Course shall have interim written and practical examinations and a final Internal Examination followed by Certification Board Examination. (Date shall be announced later). All the participants completing the course shall receive certificate on completion from New Age Yoga Institute and those passing final examination shall receive final certificate from QCI .